The Holy Father on "Father"
Father -- with this word I express my certainty that someone is there who hears me, who never leaves me alone, who is always present. I express my certainty that God, despite the infinite difference between him and me, is such that I can speak to him, may even address him familiarly as "thou" (German du). His greatness does not overwhelm me, does not reject me as insignificant and unimportant. Certainly I am subject to him as a child is subject to his father, yet there is such a fundamental similarity and likeness between him and me, yes, I am so important to him, I belong so closely to him, that I can rightly address him as "Father". My being born is not a mistake, then, but a grace. It is good to live even though I do not always perceive it. I am wanted; not a child of chance or necessity, but of choice and freedom. Therefore I shall also have a purpose in life; there will always be a meaning for me, a task designed just for me, there is a conception of me that I can seek and find and fulfill. When the school of life becomes unbearably hard, when I would like to cry out as Job did, as the psalmist did -- then I can transform this cry into the word "Father" and the cry will gradually become a word, a reminder to trust, because from the Father's perspective it is clear that my distress, yes, my agony, is part of the greater love for which I give thanks. Social networking, texting, email and digital messages have borrowed the keys to the English language and are joy-riding all over the landscape, smashing body panels and junking up the fancy interior. Many thoughtful people are worried. I enjoyed that more than all the rest of the paper. Sidebar: Blogspot, the high-tech child of Google, doesn't recognize texting as a word. And having typed that sentence, I notice that Blogspot doesn't recognize Blogspot either. Is that irony or am I thinking of something else? Fowler's is in the other room where Herself is having a nap and I can't look it up. Well, here it is St Patrick's Day and I haven't a decent post for the day that's in it. And no time to put one up. I'm off as soon as I finish this to play for a wedding in Fallbrook. This should be about an hour and a half away. But as it's supposed to be lashing down with rain, I suspect closer to two and half hour since no one in this half of the state knows how to drive in the rain. If I can remember how to do it and I get a minute I'll see if I can thumb type a post from the phone. 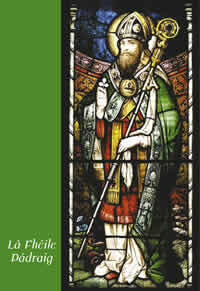 In the meantime, here's Catholic.org's post for St Patrick. Deus qui ad prædicandam gentibus gloriam tuam beatum Patritium Confessorem atque Pontificem mittere dignatus es: ejus meritis et intercessione concede; ut, quæ nobis agenda præcipis, te miserante adimplere possimus. Per Dominum. Amen. O God Who wast pleased to send the blessed Patrick, Thy confessor and bishop, to preach Thy glory to the heathen, grant, through his merits and intercesion, that by Thy mercy we may be enabled to accomplish the tasks Thou settest us: through or Lord. Amen. This site says you can watch a video of the New York parade in honour of St Patrick. And my friend Eloise sent me a link to a webpage with some gorgeous pictures of the Camaldolese monastery where the celebration occurred. You can find it here. It appears you could also tour a good part of Rome following the links on that page. Perhaps you saw it in this morning's paper: The Encyclopædia Britannica has published its last edition. I saw it in the WSJ (the online version is here) but it must have been in all the dailies. It seems they can't sell them in the two-dozen-hefty-volumes format any more, so it'll be cds, online and tablet "apps" from now on. But never mind the others. The Britannica was the gold standard. I'm not sure why I thought that. I certainly had no scholarly discernment in high school. Maybe it was because the binding was classier and the articles were longer. Or perhaps it was just more fun to browse in. Did you ever get lost in the encyclopædia? You went to look up one thing and ran across an article on something you'd never heard of or something you'd always wanted to know more about and here were ten pages on the very topic. It was even easier to get lost in the encyclopædia than the dictionary. Only the internet seems to be better at leading the curious mind off on an unintended vagary, which Hilary was writing about just the other day but which I can't cite you to because she's gone on hiatus. Again. I wish she wouldn't do that. Some writers become addictive and she's one of them. I'm having mild withdrawal symptoms. Oh, yes, the Encyclopædia Britannica. Alan Massie has a lament for the Britannica and a short history here that's worth a read. We haven't had a pipe band up for the weekend piping in a while now. This is the Bushmill Irish Pipers of San Francisco playing their medley last year at the Pleasanton Highland Games. They won their grade with this one. Keep listening for the march off and a nice rendition of The Dawning of the Day. Today is the feast of St John Ogilvie,S.J., the first canonized Scot since 1250. He was martyred for the faith in Glasgow in 1615. His grave is on the north side of the cathedral in a felon's plot, the exactly location of which is unknown. Fr John Hardon gives a fine life of and spiritual meditation on his fellow Jesuit here. There's a more nuts-and-bolts life here. The miracle that led to St John's canonization. You saw the headlines in the papers this morning about the solar flare that was supposed to occur this morning. And NASA has a nifty video showing it here. It's worth clicking the full-screen button for this one. Always assuming the said solar flare left you with internet access. Not encouraging, of course, or joyful. Nothing that would fill one with optimism. Just interesting. Good writing will do that for a lot of things. The General Assembly of the Catholic Bishops Conference of Pakistan, held from 20 to 25 March last year in Multan, Punjab, unanimously approved the proposal of Bishop Andrew Francis to submit to the Holy See a formal request to declare the Catholic Minister Shahbaz Bhatti a “martyr”. Cardinal Keith O'Brien has publicly given his support to the cause. Details at The hermeneutic of continuity.